This is about the road home. Every time we do shows and come back late at night, we drive by an area that looks like this. The valley and the old abandoned barns fascinate me. It makes me wonder about the people who used to live there and I wish we could stop the car to discover more about this magical place. Road trips make me feel light. 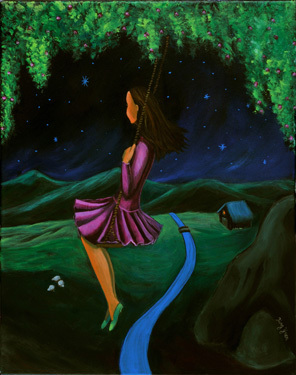 I'm like a little girl again, swinging from a tree and seeing the world from a different perspective.